Last year I blogged about how Twitter was a catalyst in the forming of a co-branding relationship that I formed with indie musician AM and Razorfish (where I was in charge of marketing). Since then, digital has once again helped launch a relationship – this time between AM and musician Shawn Lee. 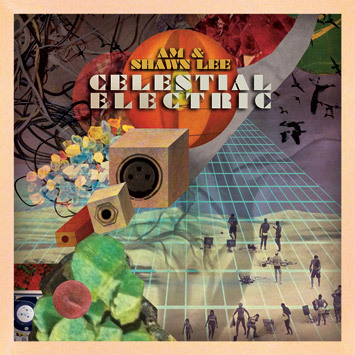 On the strength of a trans-Atlantic collaboration formed entirely in the digital world, AM and Lee have launched a new album, Celestial Electric, which was just named one of Yahoo Music’s “Ten Utterly Fantastic New Albums” of the week. As discussed by Mashable and my post on the iCrossing Content Lab, AM and Lee essentially used digital to launch a new sound, “electro soul.” The initial fruits of their work, the single “Dark into Light,” caught the attention of publications such as Rolling Stone. AM and Lee are now on tour (with Thievery Corporation) to support Celestial Electric, whose positive critical reception includes reviews such as this one and this one. Seeing AM succeed is satisfying on a number of levels. I have been captivated by his sophisticated style of music since hearing him in concert in March 2010. But I’m also glad to see a genuinely likable and cool guy like AM and his collaborator Shawn Lee get the attention they deserve. AM’s personal warmth is evident the moment you meet him, and I’m lucky to have worked with him. On the Content Lab for iCrossing (where I am vice president of marketing), I provide more insight into the story behind AM’s success. And you can learn more about AM on Facebook, Twitter, his website, and on YouTube. This entry was posted in Celebrities, Entertainment, Music, Twitter and tagged AM, Celestial Electric, Content Lab, Dark into Light, David Deal, iCrossing, Razorfish, Rolling Stone, Shawn Lee, Superhype, Thievery Corporation, Yahoo, Yahoo Music. Bookmark the permalink.